The Museum’s collection of costumes is vast, ranging from period attire to the late 90s. We have clothing for men, women, boys and girls. Our costumes are used by staff and volunteers for special events like Pitt Meadows Day, the Heritage Tea, and Museum after Dark. The collection is also used during our Museum Sundays’ children’s program for dress up and for movie making with our Balloon Head Productions club. Below is a list of the types and categories of attire found in our collection. 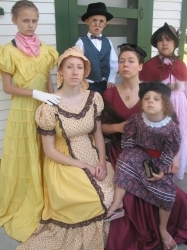 If you are looking for historical costumes for theatre or other special events, rentals are available. Please email us for more information.